When somebody mentions a mongoose, the instant image that appears in our mind is that of a cat-sized creature with an elongated head bravely battling a poisonous snake, say a cobra, and then eating it. After all, a mongoose is most well-known for its appetite for snakes. Apparently, mongooses have much bigger balls than we originally thought. Proof of this is footage taken by photographer and videographer Jerome Guillaumot from the Masaai Mara National Park in Kenya. 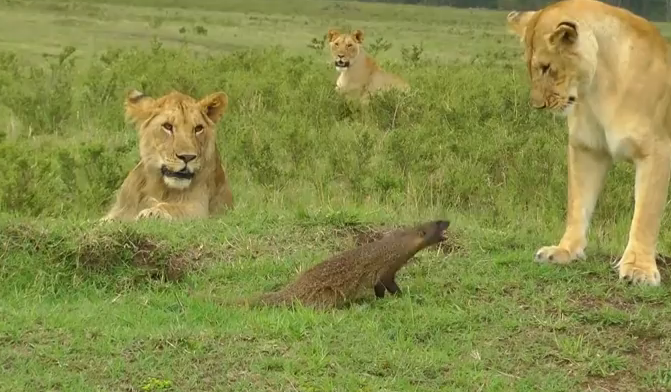 Guillaumot documented a mongoose not allowing several lions to make him a snack. A solitary mongoose can be seen bravely standing its ground against four lions that are intent on turning the poor mongoose into a mid-day snack. The lions keep on surrounding and chasing the mongoose but the little animal which is under two feet tall was able to fend them off. Growling and snapping its teeth, the mongoose was finally able to safely make its way back to its hole in the ground. The footage was taken back in 2011. Mongoose trivia:If you are a fan of the English writer and novelist Rudyard Kipling, a fictional mongoose character is featured in one of the stories in his classic book The Jungle Book. The animal was also featured in the novel The Lair of the White Worm by Bram Stoker.